I’m a sucker for chocolate anything. And I don’t like weird ingredients or too-many trips to the shops. So this recipe is awesome for meal prep ahead of a busy week (if that’s your jam). That said, I’m more of a ‘oh-crap-Its-the-last-minute-and-I-was-too-busy-to-prep-food-but-now-im-hungry’ kinda girl so I just make this as I need it. Tasty… and healthy food should never taste sad. Great for a meal prep ahead of a busy week. Quick and easy and should help keep you feeling full for while. Made using pantry ingredients you probably already have. #Winning. You don’t need to buy overpriced or hard-to-find superfoods to be healthy. The five ingredients in this recipe are some of my favourite. 2. Milk is an awesome way to get some easy protein and calcium. Use the milk you love best (I love dairy). If it’s a plant-based milk, just made sure it’s got added calcium and unsweetened is best. 3. Chia seeds are lovely sources of healthy fat and fibre. They do get stuck in your teeth (and hair… and everywhere). You’ve been warned. 4. Cacao is different from cocoa powder in that it’s got a little more antioxidants and vitamins. Is it a big deal though? Heck no. In the context of your diet, it’s not worth worrying over. Use what you got/can afford. 5. 100% maple syrup is my go-to instead of maple-flavoured syrup. That’s cause you’re getting a more wholefood/real product. It is more expensive though… so I also like to use honey if I want a cheaper option. Well, I hope you enjoy this for a healthy breakfast idea! Or healthy snack idea. Or meal prep idea!. Any way. However you want to eat it… enjoy! Like this recipe? Rate it 5 stars. Leave a comment below to contribute any ideas or notes and help others recreate this recipe. 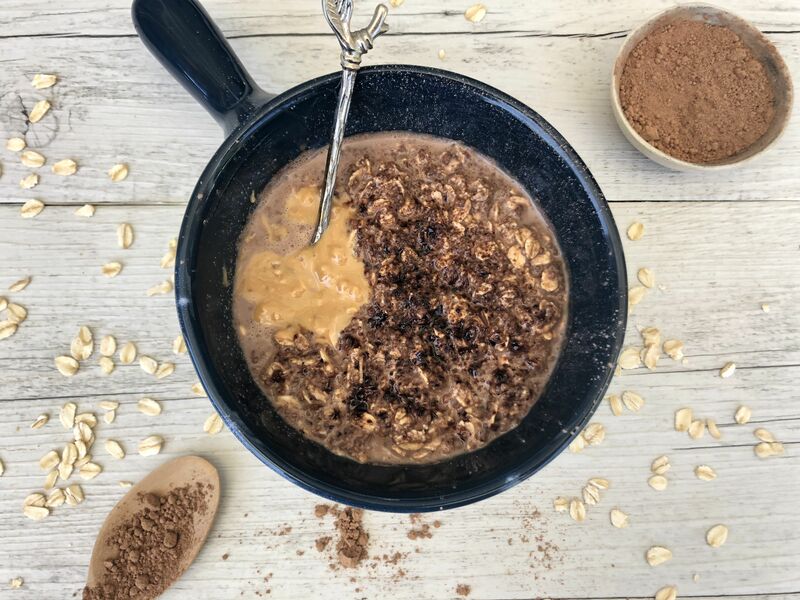 Here's a quick and healthy breakfast recipe for chocolate overnight oats with only 5 ingredients. Skip hard-to-find superfoods. It's a great meal prep recipe to make ahead of a busy week! All you need is milk, oats, chia seeds, cacao and maple syrup to create this quick and easy breakfast idea. Whack all the ingredients together in a large air-tight container. Stir and let it stand overnight. Hungry now? Just allow 5-10 minutes so the chia seeds can absorb the liquid then enjoy. Use whichever milk your body likes. I use dairy. Ingredient swaps: If you don't have maple syrup -> use honey. If you don't have cacao -> use cocoa powder. If you don't have chia seeds -> Use another seed you love like flax seeds. You can leave it overnight or eat after 5-10 minutes in the fridge. Store in an air-tight container in the fridge. It should last for a few days. Serve with peanut butter if you like.